By their very nature, roundabouts manage traffic speeds. 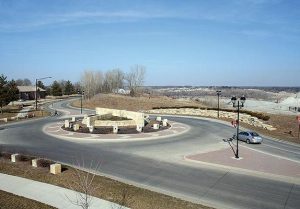 A roundabout in Coralville, Iowa (Hillary Isebrands/Institute for Transportation). Roundabouts, by their very nature, manage traffic speeds. Rural roundabouts typically have high average approach speeds. These approach speeds require additional geometric and traffic control treatments to slow traffic before entering the roundabout. Supplemental features to slow traffic may include a raised splitter, or island. Roundabouts are used typically only at intersections. However, roundabouts also force drivers, physically, to slow in the vicinity of the roundabout. The California Department of Transportation (Caltrans 2002) suggests that, in the appropriate location, a roundabout can reduce the number and severity of collisions and improve traffic circulation while reducing driver speed. Robinson et al. (2000) evaluated eight single-lane roundabouts in the US and reported a 51 percent reduction in crashes. Roundabouts are appropriate for main streets through rural communities and at rural intersections if they can accommodate large farm vehicles that may be present. The National Cooperative Highway Research Program (NCHRP) Synthesis 264 indicates the average construction cost for 14 US roundabouts was approximately $250,000 per intersection, not including the purchase of additional right-of-way (Jacquemart 1998). Caltrans. Main Streets: Flexibility in Design and Operations. California Department of Transportation, 2002. Jacquemart, G. Synthesis of Highway Practice 264: Modern Roundabout Practice in the United States. National Cooperative Highway Research Program. Washington, DC. National Academy Press, 1998. Robinson, Bruce W., Lee Rodegerdts, Wade Scarborough, Wayne Kittelson, Rod Troutbeck, Werner Brilon, Lothar Bondzio, Ken Courage, Michael Kyte, John Mason, Aimee Flannery, Edward Myers, Jonathan Bunker, and Georges Jacquemart. Roundabouts: An Informational Guide. Report FHWA-RD-00-067. Federal Highway Administration, 2000.